Nebuta Festival is one of the most spectacular festivals in Japan that features gigantic floats, which pulled by human, called “Nebuta.” The floats parade through the town, carrying the images of historical figures or Kabuki characters, followed by a group of local performers, called “haneto” and tourists dancing wildly to traditional Japanese music, “Hayashi”. On the final day of this festival, the tree best floats are chosen. 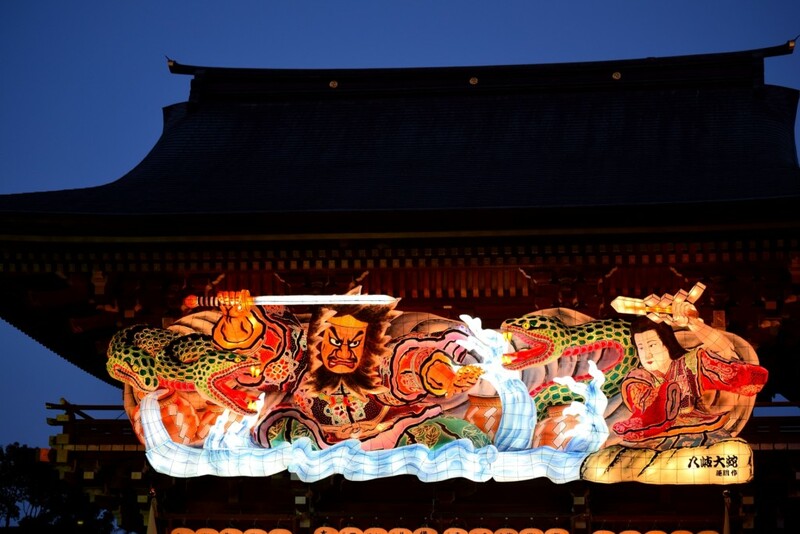 What is difference between “nebuta” and “neputa”? Nebuta is luminous paper effigies on gigantic floats in this festival. These effigies is called nebuta in Aomori while they are pronounced neputa in Hirosaki. How many people come to see this festival? As many as 3 million people go out to see the festivity. How much does it cost to make a float? To complete each float with nebuta effigies, it takes about 20 million yen as average. August 2nd to 7th in Aomori city. If you miss to see nebuta festival, you can go to Nebuta Museum, WA RASSE, which is located close to JR Aomori station. In this museum, you can learn history of nebuta and touch with gigantic float with effigies which was used in real event.